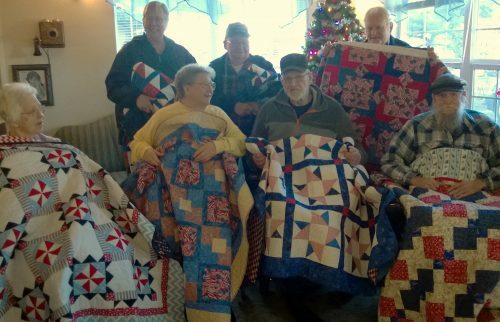 Our Veteran’s quilt project has been busy this month. On March 12 we awarded 9 quilts to veterans at the American Legion Hall in Newport. On March 19, Sonny and Ginger gave a presentation about our program to the Daughters of the American Revolution chapter in Newport. Then on March 20, Ginger presented a quilt to a 93 yr old WW2 veteran in Lincoln City. Om March 9, there was a top making party at Bayshore in Waldport. I hear there were about 12 more tops put together from out blocks of the month. Way to go all of you. So far our guild has awarded about 50 quilts to vets all over our county.